Mmmm… kale. A few years ago I would never have dreamed of uttering that phrase and drooling over any salad, let alone a bowl full of raw lemon kale salad. Maybe its the Portlander in me, but I am kale obsessed these days and sneak it into all kinds of dishes. Kale has had a bad rep for years and its resurgence is a godsend since its a true superfood. One serving of this lemon kale salad recipe has over 300% of your daily recommended intake of Vitamin A, over 200% of the recommended Vitamin C dose, and 30% of your needed calcium. With the winter plagues that have been going around his winter, I don’t know about you, but I could sure use some extra vitamins! I don’t know what’s wrong with me lately, but I feel like I have gotten every illness known to man this year. If someone sneezes a block away, I get sick. My immune system is on mutiny. While I understand that not everyone shares my love for this bitter green, frankly, they should and this is the recipe to convince the naysayers. I have made this salad with both lacinato (Italian) or redbor (the purplish kind) and both types worked great. The rough texture of kale helps the dressing stick to the greens and also keeps the salad fresh longer without wilting. I was able to bring leftovers to work for lunch the day after and it wasn’t wilted at all. How many salads can you say that about? I have served this lemon kale salad to quite a few people now and have gotten rave reviews from both my kale-loving friends and those that have been slower to warm up to this leafy vitamin packed veggie. The kale trend is here to stay so you might as well make it delicious! Fresh flavored lemon kale salad with toasty nuts and cranberries is a delicious way to get the health benefits of raw kale. Rip kale into small one-inch bite sized pieces, discarding center stems. In a small bowl mix garlic, lemon juice, mustard, salt, and pepper. Drizzle in olive oil while whisking to blend. 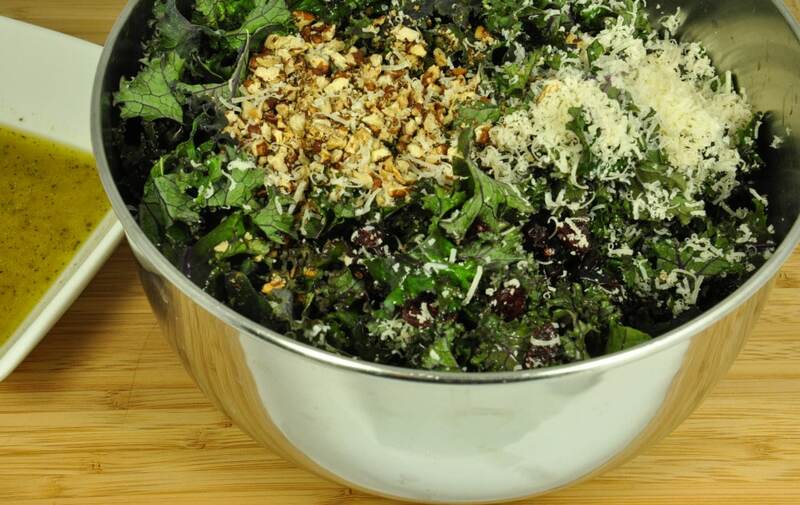 Toss kale in dressing and add in nuts, parmesan, and cranberries.